Last 4 weeks have gone by. I cannot say in a blink. The last 10 days have dragged on mercilessly. Waking up and getting out of bed are now two entirely different events. The former needing no effort and the latter being a workout. Its almost 8 am and as I sip on my chai and stare out into the gray gloomy July summer day, I wonder what my baby is up to. Everyone knows that only 5% of babies are actually born on the due date. But I am certain, no body wants to go over the date. The excitement with which we all have waited for Mowgli to show up is now tinged with anxiousness. The sun plays hide and seek in summer as does my baby. Week 37: June 26th : Baby Shower for Mowgli. It has to be the funnest shower I have ever been to. Just everything was so perfect. The sun lazily set over Lake Poway as friends and family wished Mowgli all things bright and wonderful. Drum Roll for the jungle's littlest bundle of joy! Of Raga's & Roy's and little Mowgli's shower!" Armed with suitcases filled with goodies and love for the little wonder that we await, Patti lands. The doctor had asked me at the last appt if my hospital bag was packed and I had said that I was waiting for Amma to come. Mowgli was also waiting for patti to come. Once she was here we would both be ready for anything. I also decided that that was the best time to start on maternity leave. It was the perfect plan. Only, Mowgli did not quite get it, little boy that he was. I got a few pretty scary false contractions that put me and mom in over drive. All miscellaneous small baby shopping done. Read and re-read the labor and delivery chapter in the Mayo clinic book. Made sure mom got over her jet-lag by dragging her out every afternoon to run errands and every evening for long walks. Sciatica nerve acts up big time but the possibility of something bigger happening helps over come the extreme pain and discomfort. And peacefully thus the week passed and we entered Week 39. I know by now right when it starts that the contractions are fake. I can see through the trickery. I have picked up a few books to read. Mom is hooked to Turner Classic Movies where she watches old Clark Gable movies as she plows through "The inheritance of loss". We cook and clean innumerable times a day.. trying out recipes for time pass. This rhythm will last us exactly a week. As the week draws to a close, the doctor smilingly re-assures us that "Ab Dilli door nahin". Cervix is softening, I am dilating, baby is descending.. all good signs. She sees us off with a "I hope to see you before the next appt". Week 40 : Time has officially stopped. I labor through "signs of labor" online with alarming regularity. I realize that I am not made to stay home with 24 hours to fill. Resting is a luxury for working bees and it should stay that way. Plus with Mowgli becoming heavier lying down comfortably ( even with nothing better to do) is ill-affordable luxury. Mom does not like me driving too much, so we aer pretty much under house arrest. We jump and delight at the prospect of visitors. We have a whole weekend packed with people dropping in and the dish washer being run every 4 hours. "Atithi Devo Bhava". Boredom combined with dulling of brain due to pregnancy, put me in the worst of situations. A deep cut on the index finger that sees us to the hospital for the most unwanted of reasons. As nurses and doctors go about their way, dressing the wound they joke about how the pain is nothing (even though i end up needing local anesthesia for them to clean and dress the wound) compared to what I am in for. I am in no mood for jokes. I force a smile and say "Thank god for epidural !, no ?" Fatigue, a cut finger, a horrible sore throat, dull lower back pain and false contractions. Time has officially stopped and I pat and say to Mowgli " Everything is fine. I love you to pieces. But can you come out already ?" Awww Ragini.. just relax. Mowgli will come when he is ready. Lot of my friends have gone over their due date.. its perfectly fine. :). 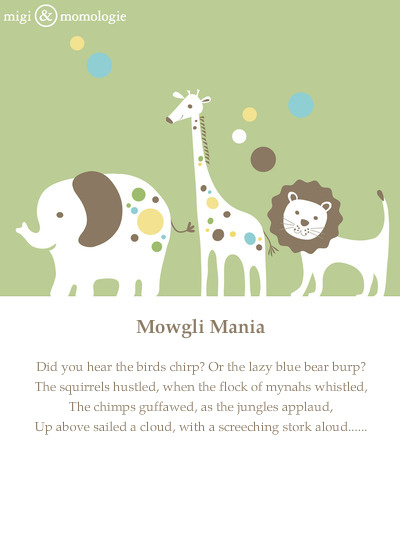 Lovely poem for li'l Mowgli.. My daughter too came out well past the due date.. my mom says that they have their own pre-destined time.. well not much of a comfort.. but you must sleep ow, once the baby is out you won't get much of sleep.. take care, Ragini.. pray that all goes well..